Summary: You don’t have to look very hard at Drew Silver to see that mistakes have been made. His fleeting fame as the drummer for a one-hit wonder rock band is nearly a decade behind him. He lives in the Versailles, an apartment building filled almost exclusively with divorced men like him, and makes a living playing in wedding bands. His ex-wife, Denise, is about to marry a guy Silver can’t quite bring himself to hate. And his Princeton-bound teenage daughter Casey has just confided in him that she’s pregnant—because Silver is the one she cares least about letting down. This has already happened to me a few times this summer, but I was still caught off guard when I discovered that there is yet another incredibly talented writer whose books I have yet to read. 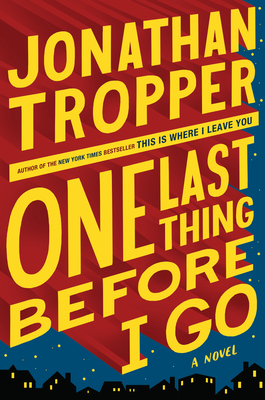 This time around it was Jonathan Tropper and his latest novel ONE LAST THING BEFORE I GO. This novel was getting some incredible buzz at this year's BEA, and I can certainly see why. I was seriously blown away by this book. And of course, now I want to read everything this man has ever written. ONE LAST THING BEFORE I GO tells the story of Drew Silver, an aging ex rock star (well, the song was a one hit wonder, but still...) whose better days are pretty much behind him. He lives in an apartment complex primarily made up of divorced, middle-aged men, his ex-wife is marrying a great guy, and his teenage daughter, from whom is pretty much estranged, comes to him with the news that she is pregnant. As bad as these things seem, Silver actually has something even worse going for him -- his heart is "broken" and he needs emergency surgery to repair it. Without the surgery, he is sure to die. It seems like a no brainer, but Silver decides to forgo the operation and instead work on being a better father and a better man. You see, he just isn't sure that his life is all that worthy of saving! As Silver works on making his life worthwhile, his family (including his ex-wife who is engaged to Silver's heart doctor!) try to convince him to have the surgery. Silver's pretty steadfast in his refusal; however, he does manage to take advantage of a second chance to make things right with his daughter.. and his ex-wife. But first, this family has to work through a lot of baggage from the past and they discover that it's not always easy. I loved ONE LAST THING BEFORE I GO and it's definitely one of the best books I've read this year. Mr. Tropper is an amazing writer and I enjoyed his characters and his prose so much that I didn't want this book to end. (And that's really saying something when I have hundreds of books on my shelves that I'm dying to read!) Not only is his writing incredibly smart and witty (this book is seriously funny! ), but he also managed to write about family and personal issues in a way that caused me to think. There is no doubt that Silver is a dysfunctional human being. In fact, you could probably see him pictured next to the word in the dictionary. Quite frankly, he's a mess and a bit of a pig. But what struck me as odd about his character is that I loved reading about him... and I found myself getting emotionally attached to him. Heck, I even wanted him to just get the darn heart surgery! He is one of those characters that is so real and so funny that I guarantee he will remain in your thoughts long after you finish this novel. In addition to Silver, I liked many of the characters in ONE LAST THING BEFORE I GO. The supporting cast of characters were perfect to surround (and feature) Silver, and I especially liked his daughter Casey. She was pretty smart (she got into Princeton) but she was also very funny, especially when it came to her dealings with her father. I had to laugh when she first came to Silver to tell her that he was pregnant. It wasn't because she felt close to him or really thought he could help her. Rather it was because she didn't want to disappoint any of the people in her life that she loved and respected! See what I mean? Another thing I really enjoyed about this novel was how it explored a troubled family. There are few things I enjoy more than books about messed up families and ONE LAST THING BEFORE I GO certainly fit the bill. While many scenes in the book were about Silver and his interactions with his daughter, his ex-wife, and her fiance, this novel also explored the feelings of a few of Silver's friends -- the divorced men who lived in his apartment complex. I was so impressed with Tropper's insight and social commentary on broken families and the feelings surrounding divorce. And finally, I appreciated how this novel made me think on so many levels. First of all, I loved that I had absolutely no idea what Silver was going to do about having the surgery. While he kept insisting that he wasn't having it, I still held out hope that he'd relent and at least do it for those he loved. I liked that for much of the book, I was kept hanging, and that the ending wasn't wrapped up neatly with a bow. In addition, I was extremely impressed with how Tropper incorporated some ideas about religion, faith, and even major milestones in our lives. But more importantly, it was just a well written book that was extremely smart. It touched upon some universal issues about family dynamics and life in general; and it made me think about how I live my life and how I'd spend my final days. I can think of few books as interesting to discuss as ONE LAST THING BEFORE I GO. I wasn't able to find a reading guide yet, but I'm sure there will be one available in the near future. Some of the themes you might want to explore include family dynamics, divorce, self-worth, second chances, redemption, forgiveness, religion, faith, friendship, mortality, parenting, and sacrifice. As you can clearly see, so many of the topics explored in this novel are universal to every reader and certain to generate discussion! Trust me on this one: ONE LAST THING BEFORE I GO is a must-read book! Tropper has been on my radar for a while. I swear just about every author I meet mentions his work. I can't wait to read this book!! I love his novels and can't wait to read this. Great review! Thanks for the giveaway chance. I just finished loading this on my iPod yesterday. I absolutely adored THIS IS WHERE I LEAVE YOU. He definitely strikes the perfect balance of humor and poignance, all with clever snappy dialogue. I really look forward to listening to this one! I haven't read this author and the cover doesn't really pull me in, but your review makes this sound really good. I'm adding it to my TBR! Thanks for the review. I keep here great things about this novel and would love to win it. It has everything I love -- a broken character in more ways than one, rock and roll aging star, etc. Thanks for the awesome review and giveaway. I have this in audio and must get to it soon. Maybe on an upcoming road trip with Mr. BFR. I've not read this author either. This book sounds like another gem and I'm so glad you loved it. I cannot wait to read it. I have found his writing to ne smart and witty, as you said it is in this book, and his characters are so well fashioned and realistic. I'm able to imagine them in my life! I thoroughly enjoyed your review, thank you! I am also a big fan of Tropper! Another great author, huh? My TBR list topples when I visit your site, Julie! If you say it's a must read then I want to read it. I just finished this. It is my least favorite Tropper so far - if you want to check out more of his books, I'd recommend This Is Where I Leave You or The Book of Joe.